So, you believe wealth is a blessing. 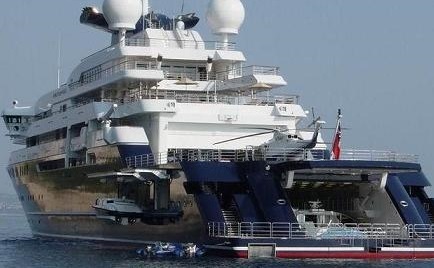 Before spending it on a $50,000 yacht or a million dollar yacht, let alone on a megayacht like Paul Allen's Octopus (right) that costs several hundred million dollars, consider this: for two dollars, one Bible can reach a country where they are banned, and every Bible that reaches such a place results on average in two new Christians (source). For the price of a $50,000 yacht, 25,000 Bibles can reach such a place and 50,000 people can be saved. For the price of a quarter million dollar yacht, 125,000 Bibles can reach such a place and 250,000 people can be saved. And as shown below, if money had been spent on Bibles instead of on ten of the largest water toys in the world, everyone in the world who still needs a Bible would have received one and a majority of the world population saved. By definition, yachts are pleasure boats. Do you really think that the source of your blessing - God - wants you to spend money - His money - on an expensive floating toy so that you can lounge around in the middle of the ocean while billions of people who need to know about God are without Bibles?